Lauren Pennington is celebrating her junior year abroad when life comes to a screeching halt. At Munich's Hofbr�uhaus, she engages in an innocent flirtation with a charming stranger for the length of a drink. Drink finished, Lauren leaves--only to be snatched from the streets and thrown into an What would you do if your daughter was kidnapped and given only a week to live? Lauren Pennington is celebrating her junior year abroad when life comes to a screeching halt. At Munich's Hofbr�uhaus, she engages in an innocent flirtation with a charming stranger for the length of a drink. Drink finished, Lauren leaves--only to be snatched from the streets and thrown into an unmarked van. To ask other readers questions about Dead in a Week, please sign up. As I briefly hinted prior; there is plenty of action in this story. So the mixture of good charac I really enjoyed this newest book from author, Andrea Kane. It has a pretty good pacing that stays steady throughout the whole book from beginning to end. I think what I loved most about this one was getting to know Aidan more. He's been in the back ground, popping in with his adorable daughter. Aidan's work with the Zermatt Group surprised me, yet was spot on with what we knew about him. I really liked that Adian and his people knew what was going on with Lauren before anyone else and jumped in to help. By going to the father right away it seems like they got a jump on things. Watching the Zermatt team work was great! They were an odd collection I think what I loved most about this one was getting to know Aidan more. He's been in the back ground, popping in with his adorable daughter. Aidan's work with the Zermatt Group surprised me, yet was spot on with what we knew about him. I really liked that Adian and his people knew what was going on with Lauren before anyone else and jumped in to help. By going to the father right away it seems like they got a jump on things. Watching the Zermatt team work was great! They were an odd collection of people, yet worked well together. As they learned more you couldn't help but to be rooting them on. As the mole was revealed I was surprised, yet not as I started to lean that way in my thinking too. I was glad that Simone was able to show that person what their greed lead to. This was an enjoyable read, even for someone like me who struggles with my plain jane flip phone (blushing). Much of the plot involved use of high tech devices that would be typical of any covert plot. Anyone who enjoys the benefits of an array of the latest communication devices and understands how they all work will absolutely love Dead in a Week. What saved me was that the narration was done so well that I got the gist of what was being applied and why. The best part of Andrea Kane’s writing i This was an enjoyable read, even for someone like me who struggles with my plain jane flip phone (blushing). Much of the plot involved use of high tech devices that would be typical of any covert plot. Anyone who enjoys the benefits of an array of the latest communication devices and understands how they all work will absolutely love Dead in a Week. What saved me was that the narration was done so well that I got the gist of what was being applied and why. Dead in a Week is an explosive story of kidnapping and espionage. The pace gradually builds as we race against the clock along with the Zermatt Group, desperate to save an innocent young woman. The plot is complex, intricate, and highly detailed. I have no doubt that an impressive amount of research went into the writing process, yet the story never feels weighed down by facts. Andrea Kane seamlessly weaves necessary details into the story as we need them. This story is highly plot-driven. Action Dead in a Week is an explosive story of kidnapping and espionage. The pace gradually builds as we race against the clock along with the Zermatt Group, desperate to save an innocent young woman. This story is highly plot-driven. Action takes center stage, driving the character interactions and development. I normally prefer character-driven fiction, and sometimes I missed the closer connection to the characters, but overall I was fascinated by the inner workings of the Zermatt Group. This is the seventh Forensic Instincts novel, and the first in the spinoff Zermatt Group Thriller Series. It reads well as a stand-alone. I received a digital review copy of this book in exchange for a fair and honest review. Dead in a Week is the seventh book in the Forensic Instincts series and the first to introduce us to the Zermatt Group. This taut suspense-thriller is filled with covert spy-like operations within the US and abroad all in an effort to thwart the kidnappers and the loss of corporate technological secrets to a foreign company. Aiden Deveraux is the defacto head of the Zermatt Group and brother to Marc Deveraux, a member of the Forensic Instincts team. Like Marc, Aiden is well-connected internationally and very well trained, militarily speaking. It is primarily due to Aiden's connections that the Zermatt Group is able to search for Lauren in such a short period of time, bouncing from New York, to California, to Germany and Croatia, and then back stateside. The investigation is multi-modal as well in that it uses high-tech computer skills and technicians as well as highly-intuitive "agents" for lack of a better term. The head computer guru is a female, as is the intuitive business management operative. The covert and military-style operations are carried out by Aiden, Marc, and one of Aiden's British compatriots. Needless to say, there's a lot going on in this story: a kidnapping, family angst and drama over the kidnapping, corporate politicking and machinations, international corporate espionage/blackmail, and more. If you've read any of the previous Forensic Instincts books and enjoyed them as much as I did, then you'll definitely want to grab a copy of Dead in a Week to read. Even if you haven't read any of the previous books in the Forensic Instincts series, I think it's possible to read Dead in a Week and not be lost by any of the previous action. If you've read some of Ms. Kane's historical fiction but haven't read any of her suspense-thrillers or romantic-suspense books, then I suggest you start with Dead in a Week and then backtrack to the beginning of the Forensic Instincts series, you can thank me later. Seriously, go get a copy of this book ASAP! College exchange student Lauren Pennington’s disappearance while studying in Munich is a parent’s worst nightmare. And Vance Pennington’s worst fears are confirmed when he receives a demand from kidnappers to turn over his company’s revolutionary new technology program in exchange for his daughter’s safe return. With a deadline of one week to meet the kidnappers’ terms, Vance turns to former Marine captain Aidan Deveraux and his highly-skilled yet secretive Zermatt Group to secure Lauren’s safe College exchange student Lauren Pennington’s disappearance while studying in Munich is a parent’s worst nightmare. And Vance Pennington’s worst fears are confirmed when he receives a demand from kidnappers to turn over his company’s revolutionary new technology program in exchange for his daughter’s safe return. With a deadline of one week to meet the kidnappers’ terms, Vance turns to former Marine captain Aidan Deveraux and his highly-skilled yet secretive Zermatt Group to secure Lauren’s safe return. Thus begins a race against the clock to rescue Lauren from ruthless criminals who will stop at nothing to achieve their goal. The Zermatt Group, in collaboration with select colleagues from the Forensic Instincts Investigation Agency, undertakes a high stakes pursuit across the globe to identify the group responsible for Lauren’s abduction, track them to the hidden location where she is being held, and uncover the corporate players focused on committing a heinous act of industrial espionage that will destroy technology giant NanoUSA as Vance is about to take its top leadership position. Can Aidan and his team deliver on their promise to return Lauren unharmed despite dangerous odds? One thing is certain, this determined group of experts is prepared to pull out all the stops necessary to succeed. 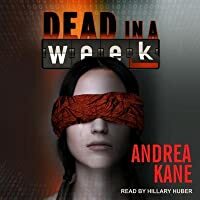 In Dead in a Week author Andrea Kane deftly crafts an intricate, fast-paced plot designed to keep readers on the edge of their seats. The characters are smart and resourceful, and their interactions are both professional and personal. Their romantic encounters are as engaging as their working relationships, demonstrating Kane’s expertise in the romantic suspense/thriller genre. I liked this one but not as much as the Forensic Instincts series. Aiden Deveraux is ex-military, wealthy, and the head of the Zermatt Group, a covert group of military and spy operatives who search the data stream for disturbing events around the world. Think Person of Interest, the television show that operates along those same lines. In this instance, Aiden learns of a young woman's kidnapping. Lauren Pennington, daughter of Vance Pennington, whose company is about to launch his latest techno I liked this one but not as much as the Forensic Instincts series. Aiden Deveraux is ex-military, wealthy, and the head of the Zermatt Group, a covert group of military and spy operatives who search the data stream for disturbing events around the world. Think Person of Interest, the television show that operates along those same lines. In this instance, Aiden learns of a young woman's kidnapping. Lauren Pennington, daughter of Vance Pennington, whose company is about to launch his latest technological invention, NanoUSA, (something the Chinese are desperate to get their hands on), has been snatched off the streets and is being held at some remote location around Croatia..
Aiden goes to see Vance Pennington to offer Zermatt's services. He arrives just as Pennington receives a message from Lauren's kidnappers. Either Pennington hands over NanoUSA to them or they kill Lauren. He has one week to comply. When Pennington hires Aiden to recover his daughter and secure NanoUSA, Aiden quickly assembles his team and they get to work. I loved the characters in this story. Aiden was a single father to little Abby, a product of his marriage to the love of his life who, sadly, passed away. While Aiden is rock solid, a warrior when it comes to the business of helping others, little Abby clearly has him wrapped around her finger. There isn't anything he wouldn't do to make her happy. Simone is Aiden's top operative, his right hand man, so to speak, and his lover. She can be found working behind the scenes or out on the street depending on what the mission requires of her. The remaining team members have varying skill sets they bring to the table, putting them to good use when necessary. I breezed through this book fairly quickly. I'm looking forward to whatever happens to be next for this group. Aiden’s team found the kidnapping and figured out why Lauren was taken and reported the kidnapping to Vance. They are also there to help get Lau Lauren Pennington is spending time at a bar in Germany when a man comes up and starts talking to her. Then just that quick she is kidnapped and held for ransom. It seems her father, Vance has some cutting edge communication technology that the kidnappers want in exchange for Lauren’s life. Thankfully Aiden Deveraux and the Zermatt Group are on the case. I like a novel that has a good plot and plenty of action. This one has both. A tech company facing corporate espionage and an international kidnapping make for a compelling story. Aidan and his team are up to the challenge, with unlimited finances and the latest technology. Kane has introduced a new covert group in this novel and I like it. I have enjoyed the Forensic Instincts novels and was glad to see some of those characters in this one. Kane manages to provide a good balance of character dev I like a novel that has a good plot and plenty of action. This one has both. A tech company facing corporate espionage and an international kidnapping make for a compelling story. Aidan and his team are up to the challenge, with unlimited finances and the latest technology. Kane has introduced a new covert group in this novel and I like it. I have enjoyed the Forensic Instincts novels and was glad to see some of those characters in this one. Kane manages to provide a good balance of character development, scene description and thrilling action. I like Aidan, brother to one of the FI operatives. I look forward to reading more novels centered on him, his talented group, and his pistol of a young daughter. She is something else! This is a great novel for readers who enjoy thrilling suspense with well crafted characters and tons of the latest technology. The Zermatt Group is founded and run by Marc's (from Forensic Instincts) brother Aidan Deveraux, whom we've met before in the Forensic Instincts books. I enjoyed getting to know him better along with his team. I liked the involvement of some of the characters from Forensic Instincts group in this book. It took me a while to get into this book. Once the initial kidnapping takes place I found the story dragged as I tried to follow all of the new characters and their jobs. I enjoyed the internation The Zermatt Group is founded and run by Marc's (from Forensic Instincts) brother Aidan Deveraux, whom we've met before in the Forensic Instincts books. I enjoyed getting to know him better along with his team. I liked the involvement of some of the characters from Forensic Instincts group in this book. It took me a while to get into this book. Once the initial kidnapping takes place I found the story dragged as I tried to follow all of the new characters and their jobs. I enjoyed the international kidnapping and plans for rescue. I am not a big fan of technology based fiction, so following the international espionage story line was difficult at times. I found it hard to keep up with the constant changes in locations, especially since several characters where flying from one place to another on a daily, sometime multiple times a day basis. I had a hard time keeping it all straight. That being said, i look forward to reading the next book in this series and hope to get to know all of the new characters better while visiting with those I've come to know and like. Excellent suspense! I loved the very detailed play-by-play. The description of all the newest and latest technology/electronic devices/spy equipment - how fun! I want to play with some of those! Makes me want to go into the CIA or something. I wonder how many of them are real or made up? Great character development. Lauren, the innocent victim, seemed very real to me. Aidan, in charge of the whole operation, was perfect and again seemed real. So many others and I am sure each person who reads t Excellent suspense! I loved the very detailed play-by-play. The description of all the newest and latest technology/electronic devices/spy equipment - how fun! I want to play with some of those! Makes me want to go into the CIA or something. I wonder how many of them are real or made up? Great character development. Lauren, the innocent victim, seemed very real to me. Aidan, in charge of the whole operation, was perfect and again seemed real. So many others and I am sure each person who reads this will have a different but my favorite was... Simon, the spy planted in Lauren's father's work place - NANO USA. For some reason I just really loved her personality. I voluntarily posted this review after receiving a copy of this book from Partners in Crime Tours - Thank You!! Love this book! Hope Andrea Kane explores more into Aiden's brother's group, love the wheel of fortune. While I was sad that it wasn't really a forensic science book would love for her to write more about this group and the combined group. It took me a minute to remember that Aidan was Marc's brother and set up the story. But then the story ramped up and off we go! There was a fair amount of suspense and surprise at the end. Enjoyed it but next time more Casey please. And get Emma a love interest please. Its a race against time to save Vance Pennington's daughter Lauren, before he is forced to hand over blueprints to their ground-breaking technology. Full of suspense, with an unexpected twist at the end. Andrea Kane is always a guarantee with her books. She makes all her characters likable. The story was well researched, giving us glimpses of how undercover work is done. Love fer Forensic Instincts and Zermatt Group thrillers! Really enjoyed the fast-paced action and the red herrings along the way to an unforgettable conclusion. A great book! Never heard of this author but will look for more. Definitely recommend. Fantastic book! I immensely enjoyed the two teams working together! I will be eagerly anticipating the next book. I highly recommend! I have enjoyed all the F.I. books and it looks like there are more to come with the addition of the Zermatt group. Part of the FI team is tasked to rescue a kidnapped exchange student in Slovenia that is being held for ransom demands of industrial espionage. Well-designed techno-thriller, with a pseudo-cyberpunk vibe. Centering on corporate warfare splashed with global espionage, Dead in a Week is complete with intellectual characters, each possessing the necessary talent to tackle the case at hand. There is a sheen to this story. Full of mystique and something else I haven't been able to put my finger on, the story is an alluring mix of action and mystery.